We stopped at Destiny USA, which I’m told is the sixth largest mall in America, for lunch. The options were plentiful, but we were on a tight time frame and some restaurants had wait times. Perhaps we shouldn’t have ridden the carousel first, but how could we resist? It was a great carousel. We decided on Uno for lunch and we told our server we had to be outside in 45 minutes, by 3:30. The server assured us it would be no problem. The food came out, after we inquired about it, at 3:20. I put my burger, broccoli and mac and cheese into a to-go box and ate it on the bus. And when I finished we were still waiting for 4 more of our group. It’s 3:49 and no sign of them yet. 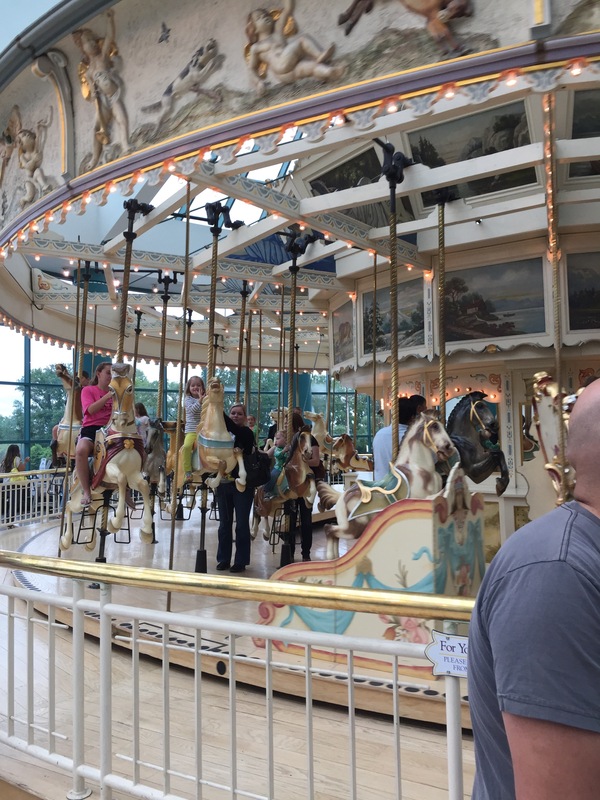 But the carousel was amazing, $1 per ride. Just found the missing people. They also ate at Uno.